Rabbits are great pets that have character, are extremely sociable, enjoy the company of humans and are a great way of introducing young children to pet ownership. They are quiet, clean and are easily toilet trained. At Kangaroo Flat Veterinary Clinic, our Dr Kara is an advid rabbit (and small mammal) lover and is experienced at rabbit surgery and medical cases. She has recently attended a rabbit sepcific surgical course, to further advance her surgical skill set. Desexing is recommended for your rabbit, both male and female. It is recommended at approx 6 months of age for a female and approximately 5 months of ge for a male. Protect against reproductive cancers(especially Uterine adenocarciomas in females). Desexed Rabbits are much easier to bond and there is less risk of agression resulting in injuries. Nutrition in a rabbit is very important. 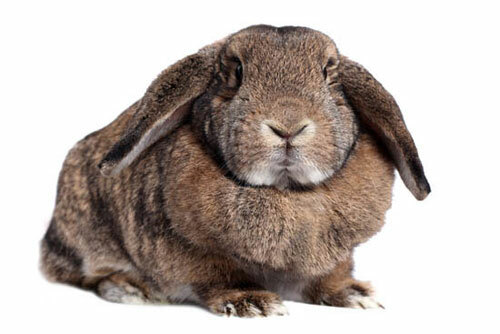 The wrong diet can predispose your rabbit to many health issues such as obesity, dental disease and urinary issues. Fibre is a very important part of a rabbits diet. 80 percent of a rabbits diet should be a good quality grass or oaten hay. Having this available at all times for rabbits to graze on is recommended. This is important for normal gut function and is key to normal dental health as it helps with the normal wear of teeth. Hay with a good portion of green material makes it much more appealing. Lucerne hay is very high in calories and is only appropriate for pregnant or very young rabbits and may cause adult rabbits to become overweight. 15 percent of a rabbits diet should be leafy greens. These should be fresh and good quality. Avoid iceberg lettuce as it causes diarrhoea and may make your rabbit quite sick. Fruit and carrots should be used as occasional treats as these have quite a high sugar content. Good quality pellets should make up 5 percent of a rabbits diet. This means only a small handful per day. These are very high energy and low fibre and very appealing to rabbits. It is important to limit how much you feed your rabbit to promote good dental health. Oxbow Pellets are the only brand that has been tested and proved to 100 percent meet the nutritional requirements of a rabbit. Rabbit mixes that are available at pet stores and supermarkets aren't always ideal for rabbits. It can be equated to junk food and has a very high sugar content and low nutritional value. This makes them very prone to obesity and associated urinary issues. It is very important that any change in diet is done gradually to allow the gut to adapt to the new food. This can be achieved by mixing the new food with the old food and gradually increasing the ratio of new to old over a period of 2 weeks. If you have an further questions don't hesitate to contact us. 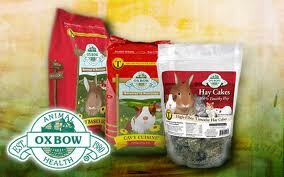 We are now stocking Oxbow Rabbit food, we are competively priced, call in today to pick up some for your rabbit.